One of the biggest sporting events is soon to be upon us and if you are like me, eating healthy isn’t too hard until there is a holiday…or birthday…or event…or someone brings cookies home…or I pass the baking isle at the grocery store…ok, so its never “easy.” It takes a lot of work to get into a good eating habit! One thing that makes eating healthy MUCH easier is identifying foods that you love that are within your personal eating plan. For me and my family we try to stay away from added sugar and gluten and try to incorporate veggies in every meal. Planning meals and snacks ahead of time also allows us another level of control over our diets; preventing us from caving when we are hangry and have to make quick decisions about what to eat. In honor of the Super Bowl, one of those days where diet usually goes out the window, I thought I would share with you some ideas for super bowl food that I love that are sugar free & gluten free. My sweet friend SueAnn introduced us to cowboy salsa and we fell in love. Full of healthy fats and yummy flavor, this filling appetizer is a favorite at our house. Make this salsa your own by incorporating ingredients you love or prefer more than what I’ve listed. 1 can black beans (drained and rinsed) substitute white beans or any other beans you love. Really like heat? add some minced jalapenos! I mix all the first 5 ingredients together and then add cilantro, salt. pepper, and lime juice until it tastes just how I like it. Its different every time! My favorite seasoning for guacamole or cowboy salsa is Flavor God’s Himalayan Salt and Pink Peppercorn. It tastes so yummy and its the only seasoning you need for this dish. I love loaded potato skins! This is another delicious snack that fills you up and leaves you satisfied. The most nutrients in a potato are found in the skin so this is definitely the way to go when eating a potato. 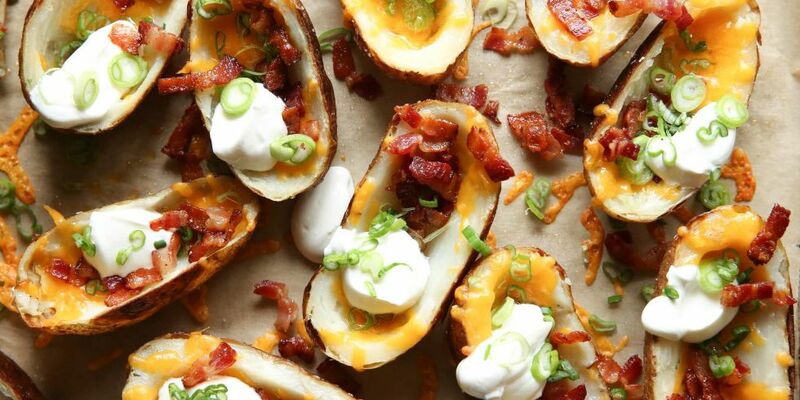 Plus there are SO many versions of loaded potato skins you can create to fit your families food preferences. Directions: Wash potatoes. Bake at 350-400 degrees until you can stick a fork in them (I crank up the heat when I’m short on time). When cool enough to handle, cut potatoes in half and scoop out a majority of the inside of the potato, enough to leave a stable “shell”. Fill with your preferred meat or meat substitute, veggies, and top with cheese.Put in the oven on broil until the cheese is melted. When the potatoes have cooled add sour cream or dressings. Want extra flavor? Smoke these bad boys in a smoker (we love our Traeger) when melting the cheese on them. No waste: Use the insides of the potatoes to make mashed potatoes, potato salad, or breakfast potatoes the next morning for breakfast. leftover potato shells can be grated into hash browns for the next morning too! Literally do the exact same thing as loaded potato skins except use zucchini instead of potatoes. However, in the case of the zucchini skins, I would recommend cutting the zucchini in half first and creating the ‘”boat” while the vegetable is still firm. It gets quite a bit weaker after cooking. Don’t overcook the zucchini or it will get soggy and wont hold its shape well. Bake @ 400 degrees for about 5 minutes. Leave it to my husband to come up with the best bacon wrapped recipes ever! The first summer we were married we managed to grow a few plants in our tiny side yard and somehow the jalapenos were the most successful…ironic because I don’t care much for spicy things…but they were good! Just like the loaded potato skins these guys are as versatile as you want them to be. 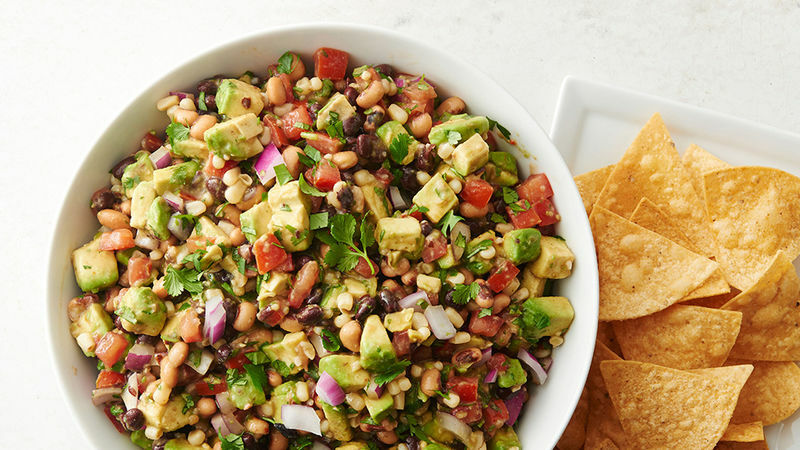 Load them up with your favorites and enjoy them for an appetizer on game day! Your favorite seasonings. Flavor God “Bacon Lovers” & “Ranch” would pair well for these. These ingredients should give you enough food to fill about a whole cookie sheet with jalapenos. My preference would be to smoke these guys until the bacon is cooked and almost crispy. If you don’t have a smoker, go ahead and bake them in the oven at 375 -400 degrees until the bacon is cooked. should be ready within 15 minutes. Tip: if you don’t love the heat of jalapenos you can boil them before stuffing them to cook them and get some of the flavor out. Our family eats a lot of mushrooms and often times I’ll make stuffed mushrooms as an entree for dinner. They are also great appetizers! 1/2 lb of sausage (make sure to find a kind that has no sugar added, ask the meat department at your store what kinds they offer without sugar. If they only have an unseasoned version you will need to add your own seasoning) If I am trying to cut back a little on fat I’ll often times mix 1/4 lb of sausage with 1/4 lb of lean ground beef or ground turkey rather than use all sausage. Directions: Wash mushrooms and remove stems. You can choose to use the stems when filling your mushrooms, save them for breakfast the next day. or discard them. I like to include mine. Chop mushroom stems in to small diced or minced pieces and put them in a bowl. Add sausage, 3/4ths of the shredded cheese (leave the rest for topping), 1 egg, and anout a 1/2 of salt & pepper to the bowl. Mix with a spoon….or with clean hands if you can’t stand trying to mix it with a spoon, like me. 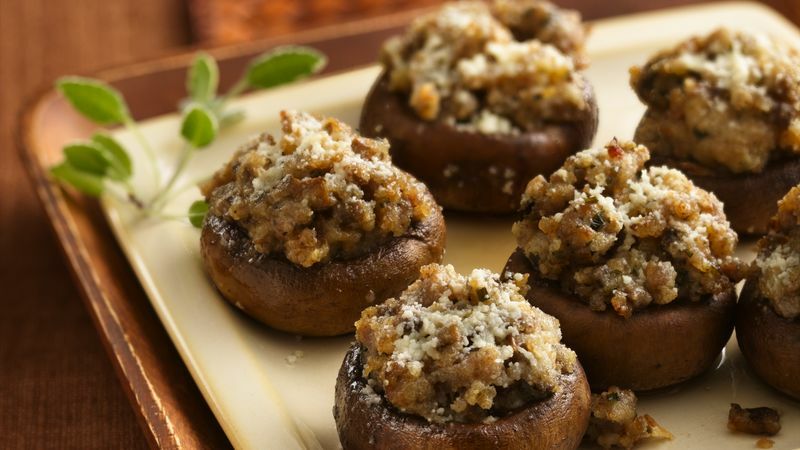 Place parchment paper on a baking sheet and use a spoon to fill each mushroom very full with the filling. Top mushrooms with cheese. Bake at 375-400 degrees for about 15 minutes or until the sausage is cooked and the mushroom is melty and bubbly (I realize “melty” isn’t really a word). Popping corn – Good ole’ Orville R is my go-to but brand doesn’t make a huge difference. Your preferred cooking oil – Olive or Coconut oil are my main oils. Get a large saucepan, cover the bottom with a layer of oil about as deep as one popcorn kernal. Turn your stove heat to medium-high and let the oil heat up. I put in one kernal to test the oil…when it pops its ready. Pour in a layer of popcorn kernals so they are covered by the oil. Put a lid on the pot……..wait……….pop………pop, pop, pop…when the popping is going crazy go ahead and turn your heat down to low to avoid burning. 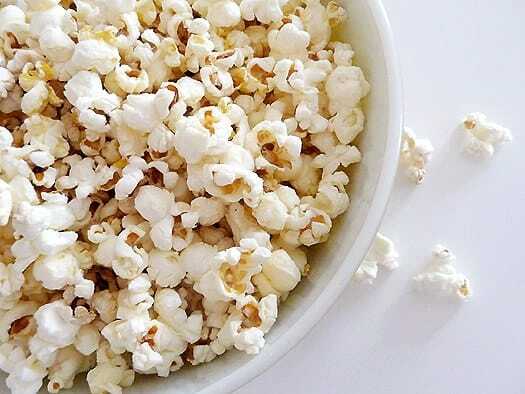 When the popping slows down with a few seconds in between pops dump the popcorn into a large bowl. Cover with salt to your liking. I know the recipes so far have satisfied more of a salty sort of hunger so I thought I would list some of the things that help me overcome that sweet tooth craving. Fruit: melon, strawberries, raspberries, blueberries, bananas, clementines. Any whole food that is sweet is ok in my book (unless you have specific inflammatory limitations). Apples and Peanut butter: PB may not be low fat but it sure hits the spot sometimes when I pair it with apples. Use natural PB with no added sugar. Even better, go to a whole foods store and grind your own peanut butter or almond butter. Dessert flavored gum – my husband things I’m crazy but chewing on some delicious watermelon gum or any of the ‘dessert” flavor gum often times helps keep my mouth busy and my sweet tooth craving satisfied when I really need to ignore the dessert table. p.s. If any of you are freaking out because there are not specific quantities of ingredients in my recipes or specific baking instructions its because that’s just how I cook ha, ha. Every time is different because every day is different. Sometimes I’m in a rush so I crank the heat up, sometimes I’m cooking for just my family of 4, other times I have 10 or more mouths to feed, so its always different. If you don’t feel strong in your ability to improvise on your own or “guesstimate” when things are done just message me and I can give you more specific help. Happy Eating!